Previously: After a wild brawl, Moose & Stephan Bonnar agreed to face Bobby Lashley & King Mo in Six Sides of Steel at Bound for Glory. 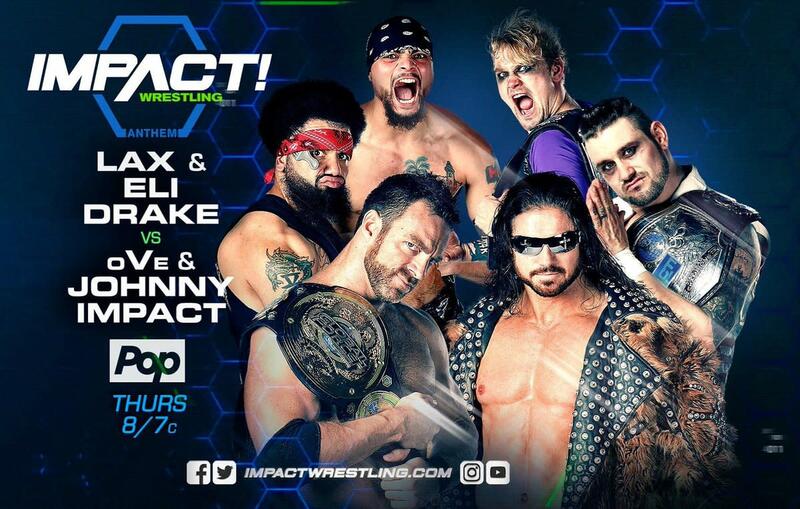 Tonight: It’s the final Impact before Bound for Glory, featuring Eli Drake & LAX vs. Johnny Impact & OVE in the main event. The heels jumped the faces to start the match and isolated Allie. Rosemary got the tag, but the heels cut her off and took over. Allie ended up getting the hot tag and ran wild. For the finish, Rosemary and Allie used a codebreaker/German suplex combination to win the match. - At the Impact Zone in Orlando, Bobby Lashley, Dan Lambert, and American Top Team came down to the ring. Lambert said that at Bound for Glory they’re going to expose the wrestling industry and put Impact out of business. He promised that Lashley and King Mo would be victorious at BFG. Kitamiya and Okabayashi traded stiff shots to start this off. Moose later scored a close near fall on Kitamiya with a hesitation dropkick. Kitamiya fired back with intense shots but missed a charge in the corner. Moose and Nakajima brawled around ringside, with Okabayashi getting the better of a clothesline exchange with Kitamiya. Okabayashi used a splash from the top for the win. - At the LAX Clubhouse, Eli Drake and Chris Adonis tried to enter but Diamante searched them first. Drake and Konnan agreed to work together to take out their enemies tonight. Konnan promised Drake that they’re coming for the World Championship next. This was a non-title match, though all six guys will compete in an X Division Championship match at Bound for Glory. Dutt connected with a moonsault to the floor, taking out a bunch of guys. Williams hit the Canadian Destroyer on Sydal, but Xavier broke up the pin attempt. Xavier hit a double back flip into a kick on Lee for the win. - Jeremy Borash interviewed Gail Kim in the ring. She discussed being the first Knockouts Champion. She talked about this Sunday being her final Bound for Glory and her opponents at the pay-per-view, then promised to win the title on Sunday. - On the final episode of Global Forged, Hakim Zane won the competition and will be a part of Bound for Glory. Before the match, LAX and OVE started brawling around ringside until Johnny Impact came out. Drake hid by the entrance and jumped Impact as he entered, with the heels beating down the faces. Impact dove onto the heels and took them all out. Back from commercial, the faces were in control and worked over Ortiz. But the heels took over, isolating Jake Crist. Impact got the hot tag and ran wild. The finish came when Impact pinned Santana with a sunset flip. After the match, Drake and Adonis beat down Impact in the ring while LAX and OVE brawled to the back. Santana hit a flip dive off the stage onto OVE. Drake and Adonis used a box cutter to tear up the ring, pulling off the mat and exposing the boards underneath. Drake gave Impact the Gravy Train on the exposed part of the ring to end the show.